I have lusted over the Harry Allen gold piggy bank since I laid eyes on it. It is just so shiny & pretty and a work of art on its own, the bank part is just an added bonus. But whats not a bonus is the price tag. Ouch! 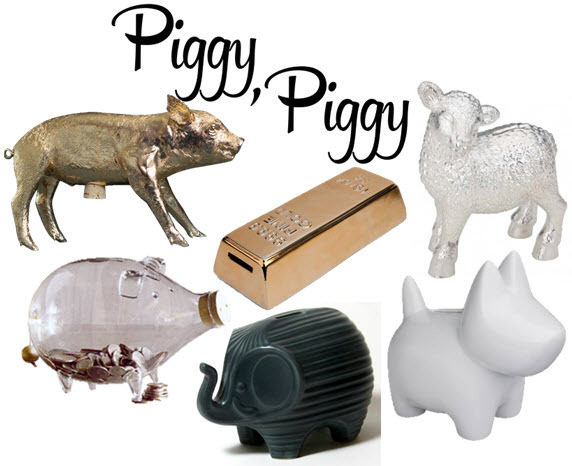 I bet you will find a way to DIY a pretty pig...papier mache or find something plastic and spray paint it gold? I will be on the look out. Two different people have given me the gold pig as a gift--my husband and mybest friend. Isn't that funny? (One went back). I do love it so! all things elephant and i'm SOLD - my SIL is all things pig :o) - total charms!